Some of you may have read from the last Tuesday Tunes post when little k and I collaborated on the music selection and came up with Mark Roson, but what you don't know is all of the behind the scenes reminiscing that went on... oh and we went way back! We went back to the late 90's and 2000's venturing through various music genres and compared how they shaped our lives. Now little k and I are nearly five years apart so while I was thinking I was all grown up listening to my rap or rock stage, I never stopped to think that baby sis might be jamming to that too... that's the beauty of getting older and becoming best friends. Getting to hear her life from her point of view, not just my older, bossy, know-it all side. Well it seems that Missy Elliott struck a cord with both of us... from her lyrics, her boldness, her self confidence in NOT having to be one of the thin provocative female rappers, and her fashion... literally the woman's music videos were basically Adidas ads!!! Coincidence or did she really just love the brand that much? I remember my first pair of Superstars... I saved all my money for them and even changed out the laces to some thicker black ones! 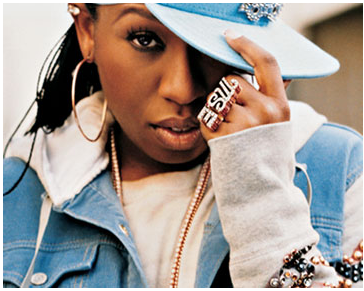 She was just so fresh and in your face for the time period, really carving the way for female rappers to follow. Listening to hers songs together, it was funny to share what memories each one stirred up in us... each in such different stages of our lives.